Here's my latest attempt at class design. This version of the Assassin as a base class started as a "reskinning" of the Inquisitor (my first attempt as class reskinning is the Saint). Basically, I did this because I never liked the way the Inquisitor was designed - as the ultimate badass lone wolf. I don't think it something good for party-based games like Pathfinder (besides, it brings me really bad memories). No, I never read Solomon Kane (something I must correct), but if we must use the Inquisitor "mechanical niche", I prefer a more classical archetype - the Assassin. The new base class below wasn't playtested (and given my record with new classes, it's possible overpowered). The text also needs revising (sorry, no time). Any feedback is welcome. I tried to design a "martial" and a "mystical" assassin. 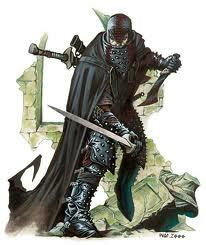 My sources was (initially) the Inquisitor and (later) the Assassin prestige classes from both Pathfinder and D&D 3.5. Finally, my literature inspirations are the assassins of the Malazan Book of the Fallen - a mix of a ninja, a commando and a really badass lone fighter (you can add a few Monk/Ranger levels if you want to simulate guys like Kalam Mekhar). The assassin’s class skills are Bluff (Cha), Climb (Str), Craft (Int), Diplomacy (Cha), Disguise (Cha), Escape Artist (Dex), Heal (Wis), Intimidate (Cha), Knowledge (arcana) (only of mystic assassins) (Int), Knowledge (local) (Int), (Int), Linguistics (Int), Perception (Wis), Sense Motive (Wis), Sleight of Hand (Dex), Spellcraft (Int), Stealth (Dex), Survival (Wis), Swim (Str), Spellcraft (only of mystic assassins) (Int) and Use Magic Device (Char). The following are class features of the assassin. Weapon and Armor Proficiency: An assassin is proficient with all simple weapons, crossbows (and, light, heavy or repeating), longbows, rapiers, saps, shortbows and short swords. She is also proficient with light armor but not with shields. This is exactly like the rogue ability of the same name. The extra damage dealt increases by +1d6 every three level (1st, 4th, 7th, 10th, 13th, 16th and 19th). If an assassin gets a sneak attack bonus from another source, the bonuses on damage stack. At 1st level an assassin must choose between two traditions: mystic or slayer. Mystic: the assassin can cast spells, read the Spells section below. Martial: at 1st, 3rd, 6th, 9th, 12th, 15th and 18th the assassin can choose a combat feat, a teamwork feat, a rogue talent (or advanced rogue talent at 12th level and beyond), an extra mark use per day or a centered bonus. Centered Bonus: when using light or no armor, carrying a light load or no load, and wielding a weapon for which the class is proficient, an assassin gains a +1 bonus to all his attack rolls and CMB rolls, besides a dodge bonus to AC and CMD. This benefit can be taken multiple times (to a maximum of 5 times). An assassin casts arcane spells drawn from the assassin spell list. She can cast any spell she knows at any time without preparing it ahead of time, assuming she has not yet used up her allotment of spells per day for the spell’s level. To learn or cast a spell, an assassin must have an Intelligence score equal to at least 10 + the spell level. The Difficulty Class for a saving throw against an assassin’s spell is 10 + the spell level + the assassin’s Intelligence modifier. An assassin can cast only a certain number of spells of each spell level each day. In addition, she receives bonus spells per day if she has a high Intelligence score. 0th level: daze, detect magic, ghost sound, light, know direction, mage hand, message, read magic, sift, spark. 1st Level: abundant ammunition, alarm, anticipate peril, beguiling gift, cause fear, disguise self, detect poison, expeditious retreat, feather fall, forced quiet, ghost sound, jump, lesser confusion, obscuring mist, retrieve item, returning weapon, sleep, tireless pursuit, true strike, unerring weapon, vocal alteration. 2nd Level: acute senses, alter self, blistering invective, bloodhound, blur, cat’s grace, darkness, darkvision, death knell, delay pain, delay poison, detect thoughts, effortless armor, find traps, follow aura, fox’s cunning, hold person, howling agony, illusory script, invisibility, magic weapon, pass without trace, perceive cues, spider climb, undetectable alignment, versatile weapon. 3rd Level: arcane sight, blink, blood biography, burst of speed, countless eyes, deep slumber, deeper darkness, dimensional anchor, dispel magic, displacement, false life, fester, gaseous form, hunter’s eye, keen edge, locate object, locate weakness, magic circle against good/evil/law/chaos, misdirection, nondetection, obscure object, witness. 4th Level: battlemind link, clairaudience/clairvoyance, mass daze, dance of a hundred cuts, detect scrying, dimension door, fear, find quarry, freedom of movement, greater invisibility, hold monster, locate creature, modify memory, neutralize poison, poison, tireless pursuers. 5th Level: discern lies, foe to friend, greater false life, greater magic weapon, passwall, spell resistance, telepathic bond, true seeing, shadow step, suffocation, unwilling shield. 6th Level: dance of a thousand cuts, find the path, getaway, greater dispel magic, leashed shackles, mass cat grace, mass fox cunning, mislead, shadow walk. Upon reaching 5th level, and at every third assassin level thereafter (8th, 11th, and so on), an assassin can choose to learn a new spell in place of one she already knows. In effect, the assassin “loses” the old spell in exchange for the new one. The new spell’s level must be the same as that of the spell being exchanged, and it must be at least one level lower than the highest-level assassin spell she can cast. The assassin may swap out only a single spell at any given level and must choose whether or not to swap the spell at the same time that she gains new spells known for the level. Starting at 1st level level, an assassin can mark a foe as a swift action. To mark a target the assassin must be within 30 feet and have line of sight with the target. Once marked, the assassin gains a bonus equal to 1/2 her assassin level (minimum +1) on Bluff, Intimidate, Shadowing (see below), Perception, Stealth and Sense Motive checks. A target remains marked until the assassin loses sight of him for a number of days equal to the assassin’s level plus his Int modifier or until the mark is activated. An assassin can keep a number of marked target equal to his Intelligence modifier (minimum 1) or character level (whichever is lesser). An assassin can activate a mark as a swift action. When the mark is activated, the assassin receives a temporary bonus or special ability based on the type of mark activated. At 1st level, an assassin can use this ability once per day. At 4th level and every three levels thereafter, the assassin can activate a mark one additional time per day. This additional uses can be against the same target or other marked targets. Once activated, this ability lasts until the target is killed, disabled or until the combat ends, at which point all of the bonuses immediately end. If the assassin is frightened, panicked, paralyzed, stunned, unconscious, or otherwise prevented from participating in the combat, the ability does not end, but the bonuses do not resume until she can participate in the combat again. When the assassin activates a mark, she must select a type. Unless otherwise mentioned, all bonus work only against marked targets. As a swift action, she can change this mark to another type. Destruction: The assassin self starts a cold rage, gaining a +1 morale bonus on all weapon damage rolls. This bonus increases by +1 for every three assassin levels she possesses. Ignore Pain: The assassin trains to ignore pain, postponing its effects while facing his marked target. This causes the assassin to ignore the first 5 points of damage suffered each round as long as the assassin (or his target) is above 0 hit points. The assassin suffers any postponed damage in the next round. The pool of ignored damage increases by 5 for every three assassin levels she possesses. At 10th level, instead of suffering the effects in the next round, the assassin can choose to instantly convert the damage suffered (until his pool’s maximum) to nonlethal damage. Offensive Stance: The assassin focuses his combat skills on the marked target, granting a +1 morale bonus on all attack rolls and CMB rolls against the marked target. This bonus increases by +1 for every five assassin levels she possesses. At 10th level, this bonus is doubled on all attack rolls made to confirm critical hits. Eldritch Stance: This mark gives the assassin great focus and makes her spells more potent. This benefit grants a +1 morale bonus on concentration checks and caster level checks made to overcome a target’s spell resistance. This bonus increases by +1 for every three assassin levels she possesses. Only mystic assassins can activate this ability. Defensive Stance: The assassin heightens his defenses, granting a +1 morale bonus to AC and CMD against attacks made by his mark. This bonus increases by +1 for every five assassin levels she possesses. At 10th level, this bonus is doubled against attack rolls made to confirm critical hits against the assassin. Combat Focus: The assassin enters a self conditioned trance and gains a +1 morale bonus on all saving throws against the marked target. This bonus increases by +1 for every five assassin levels she possesses. At 10th level, the bonus is doubled against curses, diseases, and poisons. Hunter Concentration: The assassin gains a +2 morale bonus on skill checks made against the marked target or that assist in attacking, following or catching the marked target. This bonus increases by +2 for every five assassin levels she possesses. This is the only ability that be activated outside combat, but the assassin must attack (or otherwise attempt to kill) the marked target in the next 5 rounds or she’ll lose these bonus. Supernal Weapon: This assassin knows esoteric techniques to wound supernatural foes. The assassin’s weapons count as magic for the purposes of bypassing damage reduction. At 6th level, the assassin’s weapons also count as one alignment type (chaotic, evil, good, or lawful) for the purpose of bypassing damage reduction. The type selected must match one of the assassin’s alignments. If the assassin is neutral, she does not receive this bonus. At 10th level, the assassin’s weapons also count as adamantine for the purpose of overcoming damage reduction (but not for reducing hardness). At 1st level, an assassin can use Knowledge (local) to follow and find a marked target, as long as the target is inside an urban location. Follow the rules for tracking, but use the following DCs and conditions. Finding “the trail” of an individual or to follow it for 1 hour requires a Knowledge (local) check. You must make another check every hour of the search, as well as each time the trail becomes difficult to follow, such as when it moves to a different area of town. If you fail a check, you can retry after 1 hour of questioning. Two conditions deserve further explanations. No questions asked means that the assassins stays hidden or avoid contacting locals. If a Shadowing check is made without this modifier, a failure allows the target(s) to attempt a Knowledge (Local) check (DC 20) to note that someone is asking about them. Proper motivation means that the assassins use bribing or intimidation when asking about his. Bribing requires 1d10 x the community size DC in GPs or a successful Bluff check (DC 20 + modifiers from the Condition table above). Intimidation requires successful Intimidate check (same DC as bluff). Failing these checks can either increase the Shadowing check’s DC or generate other complications (like combat after a intimidate failure). At 2nd level, an assassin adds her Intelligence modifier on initiative checks, in addition to her Dexterity modifier. At 2nd level, the assassin gains a +1 saving throw bonus against poisons. This bonus increase by +1 every three levels (maximum +7 at 20th level). At 2nd level, an assassin cannot be caught flat-footed, even if the attacker is invisible. He still loses his Dexterity bonus to AC if immobilized. An assassin with this ability can still lose his Dexterity bonus to AC if an opponent successfully uses the feint action against him. If an assassin already has uncanny dodge from a different class, he automatically gains improved uncanny dodge instead. At 3rd level, if the target of an assassin’s sneak attack isn’t aware of his presence improve the sneak attack damage to d8s. At 3rd level, all of the assassin’s allies are treated as if they possessed the same teamwork feats as the assassin for the purpose of determining whether the assassin receives a bonus from her teamwork feats. Her allies do not receive any bonuses from these feats unless they actually possess the feats themselves. The allies’ positioning and actions must still meet the prerequisites listed in the teamwork feat for the assassin to receive the listed bonus. At 3rd level, an assassin becomes trained in the use of poison and cannot accidentally poison themselves when applying poison to a blade (see Poison). At 5th level, if an assassin studies his victim for 3 rounds and then makes a sneak attack with a melee weapon that successfully deals damage, the sneak attack has the additional effect of possibly either paralyzing or killing the target (assassin's choice). Studying the victim is a standard action. The death attack fails if the target detects the assassin or recognizes the assassin as an enemy (although the attack might still be a sneak attack if the target is denied his Dexterity bonus to his Armor Class or is flanked). If the victim of such a death attack fails a Fortitude save (DC 10 + the assassin's class level + the assassin's Int modifier) against the kill effect, she dies. If the saving throw fails against the paralysis effect, the victim is rendered helpless and unable to act for 1d6 rounds plus 1 round per level of the assassin. If the victim's saving throw succeeds, the attack is just a normal sneak attack. Once the assassin has completed the 3 rounds of study, he must make the death attack within the next 3 rounds. At 5th level, an assassin can execute a coup de grace as a standard action. Her attacks also become more deadly. Any target reduced to 0 hit points or less, automatically suffer 1d6 bleeding damage. At 6th level, an assassin becomes a master at hiding weapons on his body. He adds his assassin level to all Sleight of Hand skill checks made to prevent others from noticing them. At 6th level, whenever an assassin kills a creature using his death attack during a surprise round, he can also make a Stealth check, opposed by Perception checks of those in the vicinity to prevent them from identifying him as the assailant. If successful, those nearby might not even notice that the target is dead for a few moments, allowing the assassin to avoid detection. At 8th level, whenever an assassin uses her mark ability, she selects two different marks, instead of one. This only consumes one use of her mark ability. As a swift action, she can change one of these marks to another type. At 9th level and higher, an assassin can no longer be flanked. This defense denies a rogue the ability to sneak attack the assassin by flanking him, unless the attacker has at least four more rogue levels than the target has assassin levels. If a character already has uncanny dodge from another class, the levels from the classes that grant uncanny dodge stack to determine the minimum rogue level required to flank the character. Starting at 10th level, anyone slain by an assassin's death attack becomes more difficult to bring back from the dead. Spellcasters attempting to bring a creature back from the dead using raise dead or similar magic must make a caster level check with a DC equal to 15 + the assassin's level or the spell fails and the material component is wasted. Casting remove curse the round before attempting to bring the creature back from the dead negates this chance. The DC of the remove curse is 10 + the assassin's level. At 11th level, an assassin can use the Stealth skill even while being observed. As long as he is within 10 feet of some sort of shadow, an assassin can hide himself from view in the open without having anything to actually hide behind. He cannot, however, hide in his own shadow. At 11th level, an assassin can make a coup de grace through a ranged attack, but the target must be within 30 feet of her. She can execute sneak attacks against targets within 60 feet. At 14th level, the assassin learns to take advantage of any opportunity that presents itself. Whenever the assassin scores a critical hit, she ignores any damage reduction the target might have. In addition, if the target has regeneration, the creature loses regeneration on the round following the critical hit and can die normally during that round. Creatures whose regeneration always functions are immune to this ability. Finally, if the assassin deals energy damage to a creature with vulnerability to that energy type, she deals +1 point of damage per die rolled. At 15th level, whenever an assassin uses her mark ability, she selects three different marks, instead of just two. This only consumes one use of her mark ability. As a swift action, the assassin can change one of these marks to another type. At 15th level, once per day, an assassin can make a death attack against a foe without studying the foe beforehand. He must still sneak attack his foe using a melee weapon that deals damage. At 17th level, an assassin heightens his slaying prowess. She can execute sneak attacks against entangled, exhausted, prone, shaken, sickened and staggered targets. She can execute a coup de grace against confused, cowering, nauseated and stunned targets. At 18th level an assassin can sense his marked targets’ direction (if on the same plane). When within 60 ft. of a marked target, the assassin can pinpoint his position. At 20th level, once per day, an assassin can call true mark down upon a foe during combat. Whenever an assassin uses her mark ability, the assassin can invoke true mark on a foe as a swift action. Once declared, the assassin can make a single melee (or ranged attack, if the foe is within 30 feet) against the target. If the attack hits, the victim dies. The target is allowed a Fortitude save. The DC of this save is equal to 10 + 1/2 the assassin's level + the assassin's Intelligence modifier. Regardless of whether or not the save is made, the target suffers the full effects of a critical hit plus a backstab (see the class ability).